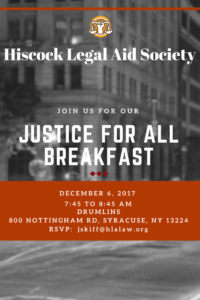 Justice For All is a breakfast event taking place on December 6, 2017 from 7:45 am to 8:45 am at Drumlins. This fourth annual event helps Hiscock Legal Aid Society continue to provide free legal services for some of CNY’s most resilient, yet marginalized, residents. The breakfast is free and open to the public. It lasts one hour. During the hour, guests are taken on a virtual tour of the mission and vision of HLAS. Attendees will hear from agency leadership (the Chief Executive Officer and Board Members) as well as a few clients who’ve been served by HLAS programs. Guests are invited at the end of the breakfast to make a contribution to HLAS. There is no minimum and no maximum and giving is confidential. Guests may RSVP by emailing jtorreano@hlalaw.org or via WhoozIn.